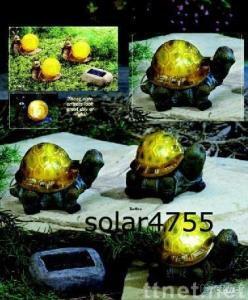 Sets of 3 solar Animals(SOALR4755(tortoise)). among the plants in your garden. that looks like a rock. light up the animals at night. and the liqhted animals in the shade. and 12" between each animal. Includes an on/off button on the bottom of each. please fell free to contact me if you have any inquiry.